Hey there friends! I hope you had an amazing Memorial Day weekend!! It was a rainy Memorial Day but we made the best of it. We took the boys to the circus, of course went to the gym (can't break routine lol), and then finished with an indoor BBQ with family. Such a fun filled weekend! I hope yours was the same. Not going to lie the rain was a bummer and it's still going strong! I love the rain (it relaxes me) but right now I'm just so ready for pool days and it won't stop raining! Every time we go to put out our American flag it rains! I'm not even joking. What's with that!? Memorial Day AND the 4th of July for the past 3ish years it has rained. Maybe it's some kind of symbolism... I mean both days are about the sacrifices made to obtain our freedom and maintain it. Either way I think it's weird it always rains on those holidays. Have you found the same thing or is it just weird wherever I go lol. Ok so for the real reason you stopped on by! By the way thank you for all the love with this blog! It really means so much to me to here from you and know when you've tried things we've chatted about over here. Your support means the world to me so thank you so so much! 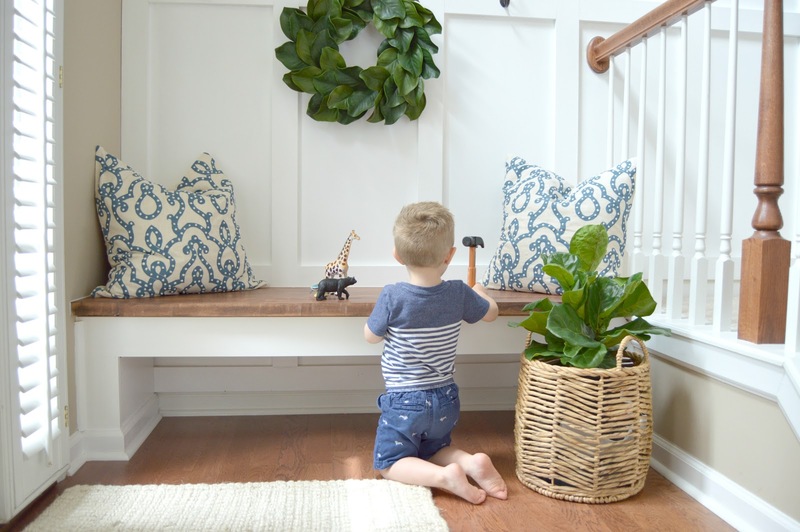 If you saw the wainscoting tutorial you know we also built our entryway bench to give that mudroom feel. 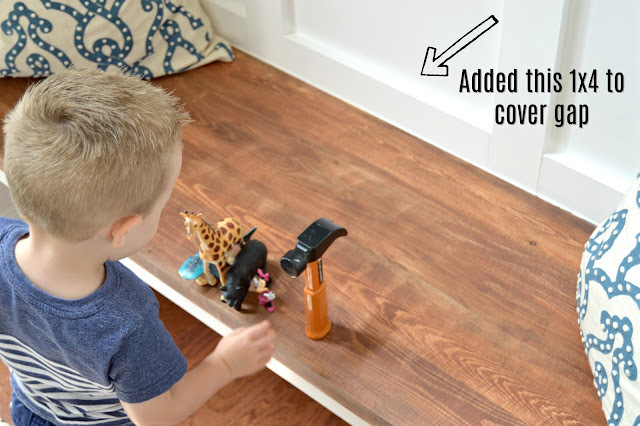 There are lots of ways to do this but we wanted it to look like it had always been there so we matched it to our baseboards and kept with the white trim look. First we removed the baseboard where we wanted the bench to line up to the wall. This is important for accurate measurements. 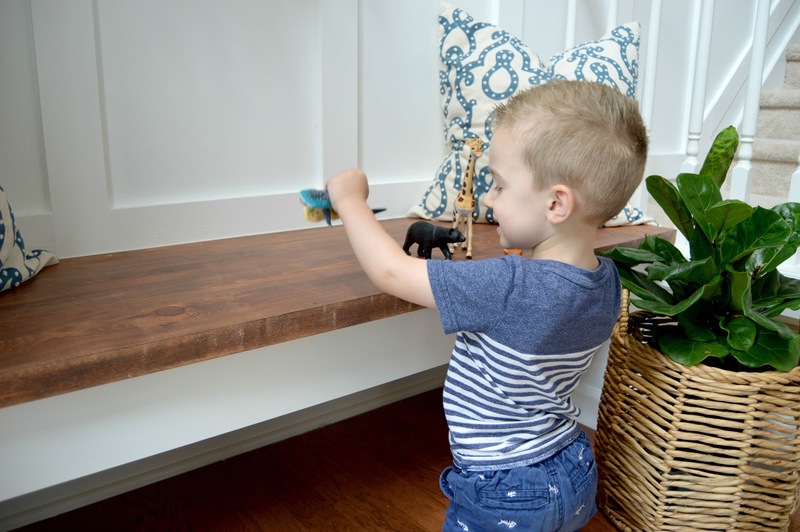 If you don't really care about the bench flowing into your baseboard, you can skip this. Once that was removed, time to measure. We just wanted a very natural seat when you go to put your shoes on. (Crazy all the things you all of a sudden realize you need to think about when you go to do projects like this!) It's all in the details folks! Measure twice cut once! The height we found perfect for our seat was a total height of 18inches and a total depth of 18.25 inches. Knowing we wanted the top of the seat at 18, that meant when building the base the height we stopped at was 16 inches to allow room for the stained wood seat. Cut 4 (12 inch) 2x4s to use as the legs. When placing the legs think about if you want your seat to be flush with the base or if you want a little bit of a lip. Our seat hangs out 1.25inches further from the base for reference which makes total measurements for our base (not including the seat) 16inches tall and 17inches deep. Once the legs are cut, using the Kreg Pocket Hole Kit, Eric screwed another 2x4 piece at the base between the two legs to prevent any kind of shifting. Take two 2x4 pieces the length you want your bench to be and secure on top of the legs. When placing on top of the 12inch legs, your total height should be at 16inches. Secure on top of the legs using wood glue and that pocket hole guide. We have the Kreg but I'm sure there are different versions out there. Similar to what we did with the 2x4 between the base legs to prevent shifting cut 2-3 additional 2x4(s) for cross beams and secure with pocket holes between the 2x4(s) that run the length of your bench. You just want to add reinforcement so you don't have to worry about your seat falling apart. I'm pretty sure no one wants to worry when you watch someone sit down to put their shoes on.... At this point your base should be pretty sturdy. After we got the foundation of the bench where we wanted, we just covered the 2x4 base with some generic wood that was 1inch thick. Think of making a box around the legs and just a smooth plank running across the length of the bench. To secure the wood we just used a nail gun and then filled in the holes with spackle. This is purely cosmetic just to cover the 2x4(s) and make for a smoother finish. Now that the wood is covering the base, go ahead and use the baseboard you matched to your current base boarding to line the legs of the bench. Use the nail gun to secure, fill holes with spackle and wait to dry. The last step was to paint the base white. We painted it using the Behr Premium Plus Paint to match the wainscoting. K side funny moment. As I'm typing this blog and measuring the bench, Tyson just ran up to me with the "small tape measure" and had me pick up the big one. He then said "Cheers!" which sounded more like "Sheeers!!!" and we clinked our tape measures together after which he quickly laughed and ran away. LOL I love being a boy mom! Time to make the seat!! Cut 4 2x6 pieces the length you want your bench to be. Once cut, using the wood glue, glue two pieces together and finish securing using the Kreg pocket hole screw tool. Repeat until all four pieces are secured together. It's important to use the glue as well to really cement the wood together. This prevents warping and flexing later on. After glue is dry, distress as desired. (or don't distress it's up to you!) We used a round sander to create some distressed looking lines and edges. I love a slight distress because as it gets used and actually distressed, it will all look natural instead of little nicks standing out. For the stain we actually used two different ones to get the look we wanted. Starting with American Walnut lightly stain wiping excess with a paper towel. This alone was too red so we followed very lightly with English Chestnut wiping excess again with paper towel. Allow to set overnight before applying your Polyacrylic. I like the Polyacrlic more than a polyurethane because it has more of a natural satin finish rather than a high sheen if that makes sense. You could also use a wax but for this being more high traffic I wanted something a little more durable and less likely to show scratches of any kind. After applying the polyacrylic you'll want to allow that to cure overnight as well. I recommend leaving this in the garage or a very well ventilated area as the fumes can be pretty strong regardless of what you're using. Here are what we use for the polyacrylic, polyurethane, and wax. We've used all three in different projects so you can decide what kind of finish you want. Ok so now our thought was how to we distribute the weight across the bench so It's not all just resting on those 2x4(s)? To help distribute the weight, we took just leftover pieces of wood that were 1" thick and spaced them out across the top of the 2x4(s) that ran the length of the bench, screwed them down, and put wood glue all across the top surface. Quickly after applying the glue, we carefully set the bench top down on top of the bench and allowed to dry. To finish, we used the same molding and trim sealant to go along the edges of the bench against the wall for a clean smooth line. **Side note. 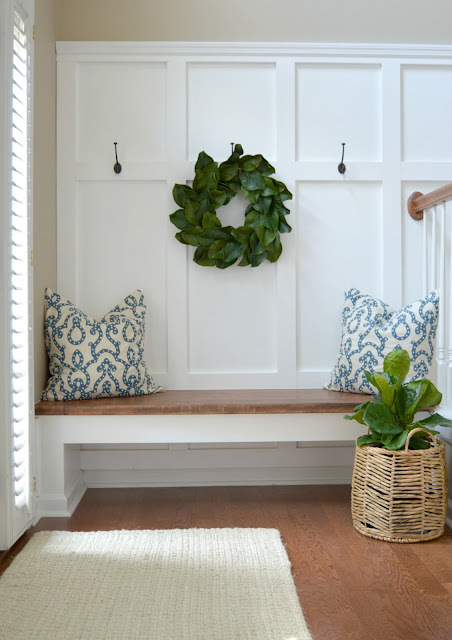 If you are using the bench to go against the wainscoting like we did, you'll notice a gap between the back of the wall and the bench because of the wainscoting. 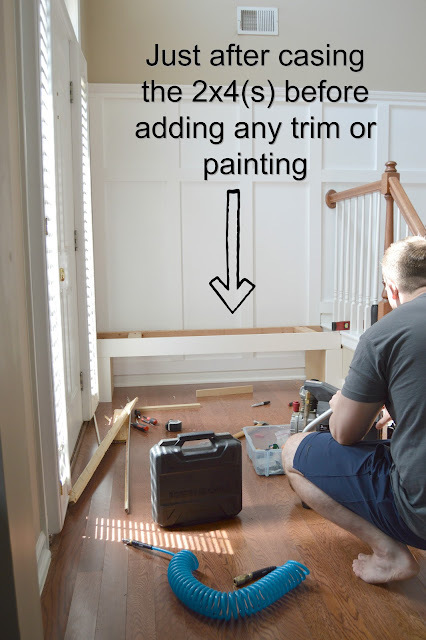 To remedy this, we cut 1x4 pine pieces that matched what we used for the wainscoting and made a horizontal line at the top of the bench. K......I think that's it!! Lol are you still with me? I'm learning tutorials aren't so easy for me lol. I don't want to leave out any details and try to paint a picture for you. That pic may be super abstract but hopefully you get the idea. Please don't hesitate to ask any questions you might have in the comments below. Someone else could have the same question. So there are only a few days left of the Nordstrom semi annual sale and I found some AMAZING deals. A few of these things I am also going to get as wedding gifts for some family friends. The coasters would be great to keep on hand in your gifting closet for a last minute gift as well! So many good finds! !